Known for its diverse flavors and spices, Mexican cuisine has a predominating Spanish influence, with a twist of European, French and African, thanks to the history of Mexico. What is different about Mexico’s cuisine is that it varies by region. Northern Mexico offers varieties of beef, goat and ostrich dishes. Central Mexico is a mix of the influence of other regions of Mexico, offering carnitas, tamales, and barbacoa. Southeastern Mexico is known for its varied use of spices, with a little Caribbean influence. There is also a wide use of fish in areas near the Gulf of Mexico and Pacific Ocean. Corn and bean-based dishes are prominent in Mexico – prepared in various ways – think hot quesadillas, nachos, spicy beans and crunchy tacos! Today, Mexican restaurants are found all over the world, and anybody can try the tacos, salsa, tortillas or the fiery enchiladas topped with hot chilli sauce. But to get the real taste of Mexican cuisine, you must taste it when it’s been freshly prepared and served in Mexico! Its incredibly delicious and you will absolutely relish it. ENCHILLADAS – This is the star dish of Mexican cuisine! To put it simply, an enchilada is a tortilla wrap which is filled with a whole lot of tasty ingredients. The fillings normally include a combination of meat, cheese, beans and vegetables with seafood and sometimes even potatoes. The enchiladas are then baked with grated cheese and topped with some delicious and fiery chilli sauce. A delight to the tastebuds! TORTILLAS FRESH OFF THE COMAL: Tortillas are made from flour or maize and were traditionally used by Mexicans as bread. 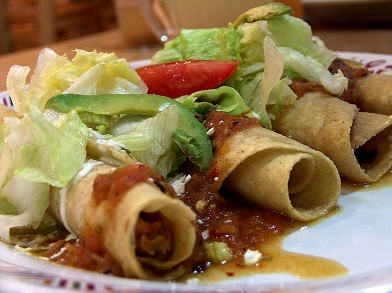 The Aztecs used tortillas to wrap around food, but today, tortillas are rolled and baked in enchiladas, fried for tacos or grilled for quesadillas. The comal is a round, clay Mexican grill, on which fresh hand-pressed tortilas are heated. When the tortillas puff up a little they are flipped to heat the other side. When they’re firm and cooked, they are filled with mushrooms, squash flowers or pork to make quesadillas, empanadas, or memelas. Don’t be surprised if you end up downing a lot of them! CHILAQUILES: Tangy and creamy defines this dish. Chilaquiles are toasted tortillas covered in green or red salsa, shredded chicken, raw sliced onions, epazote (a Mexican herb), white cheese and sour cream. Red chilaquiles are made with a blend of tomatoes and dark purple and red chilles while the green chilaquiles are made with the sharp, seedy goodness of tomatillos. Chilaquiles are served sizzling, in a clay pot, with the green or red sauce and the white cheese bubbling. Mmmmm! TACOS – Tacos are fresh, handmade tortillas stuffed with small chunks of grilled beef rubbed in oil and sea salt, then covered with guacamole, salsa, onions, cilantro or just about anything else that you prefer. It’s quite interesting to see chefs carve out generous portions of hot chicken or beef from a spit and pile it into a fresh warm corn tortilla which is then folded into a half moon shape and flavoured with guacamole, chilli sauce and fresh coriander (cilantro). The best place to enjoy this classic dish is to buy it from one of the street stalls just like the locals do. It’s the perfect dish for breakfast lunch or dinner. A classic that’s a big hit! MOLE – Pronounced as “mole-ay”, this is a one rich, tasty and complicated sauce which is made of a very unique combination of various spices, tomatoes, garlic, chillies and chocolate! Yes chocolate! Usually served with turkey, but its not unusual for it to be served with pork or chicken too. It also tastes superb over enchilladas. Try it once and you’ll be hooked! ESQUITES/ELOTES: – Esquites are a delicious snack consisting of grains of corn which are boiled in salted water and then sautéed in butter with some more salt, onions, chopped chillies and epazote (a native Mexican herb). This flavourful concoction is then served in small cups and seasoned with lime juice, mayonnaise and chilli; the perfect snack to eat whilst you’re out and about on the streets. Elotes are the same thing but served as corn on the cobs instead of in a cup. This is one tasty treat that just should not be missed! TAMALE: This is a traditional dish of Mexico that has been around for thousands of years, but even today, is loved just as much! Like the sandwich, it is a very versatile dish in terms of the fillings and flavors. The dish consists of a corn based dough which is wrapped in a plantain leaf and then steamed or boiled (with the leaf being discarded before eating). The dough is usually filled with meats or fish, cheese, vegetables and spices, the most popular fillings being chicken and pork and is served with mole or salsa. The tamale, swaddled in banana leaves or cornhusks, tasting of moist maize and meat and slow-cooked sauce, is the heart of all things Mexican.Replace the meat filling with fruits, sweetened raisins and some pink food color, and it turns into Tamal De Dulche, a mouth-watering desert! POZOLE – This is the traditional soup of Mexico. It is made from hominy and stewed for hours with chicken, pork, or some other type of meat. After everything has been cooked and simmered for hours, you dish it up and put lettuce, radish, onion, lime, oregano, and chile on it and plenty of lime juice. Pozole can be clear broth, or green (with green mole) or even red and spicy. Nothings better than a steaming bowl of pozole to boost up your energy levels! BARBACOA – Barbacoa is a method of cooking meat from which the term ‘barbecue’ orginates. Barbacoa is made by roasting a whole sheep or lamb in a pit dug in the ground. The meat slow-cooks for days underneath the cover of maguey leaves. No marinades or sauces are used. When the meat is tender, it is taken out of the pit and served with a variety of sauces, guacamole, and lime. Traditionaly, this dish was used by Mexicans for festivals and weddings. A must-try for all meat lovers. SALSA: Salsa, a Spanish word for sauce, is uncooked and often pureed until chunky or smooth. Salsa is a staple in Mexican cuisine for many generations. Modern methods of making salsas incorporate red and green tomatoes, onion, chipotles, avocado and cilantro. Salsa is served as a relish or dip to accompany a meal. GUACOMOLE – Guacamole is a dip or garnish and is one of the most famous Mexican food items. 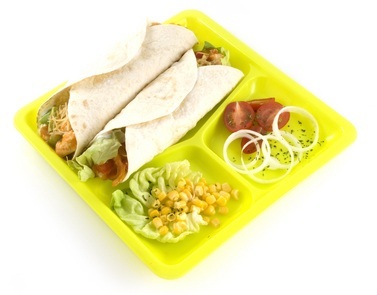 It is made with mashed avocados blended with onions, chilles and cilantro and lime juice. Adds that zing to any dish! FRUTA CON CHILE: This is a unique combination of some seasonal fruit, like mango or jicama or cucumber, doused in lime and topped with some chili powder and sauce. So quintessentially Mexican and so tempting, it’s just impossible to resist a bite. TACOS AL PASTOR: This is made with pork or other meats, that are seasoned and cooked on a spit and then stuffed into tiny little corn tortillas. They are served with a little pineapple, onion, cilantro, lime, and maybe a little salsa. Yummy!! CEVICHE: Ceviche is prepared by marinating raw fish in lime juice. The acids produced by the lime juice cook the fish lightly. Ceviche is a fresh fish delicacy which is usually served on the beaches of Mexico and is delightful as an appetizer. TORTA CUBANA: Torta Cubana is the greatest mexican torta. It is filled with a lot of ingredients – all kinds of meats that you can possibly think of plus cheese, potatoes and sometimes even some thick pickles. Tasty indeed, but its quite big and filling, so is only meant for people with a big appetite. Mexican food has no match…try some of these dishes and you will know why I decided to settle in Akumal!